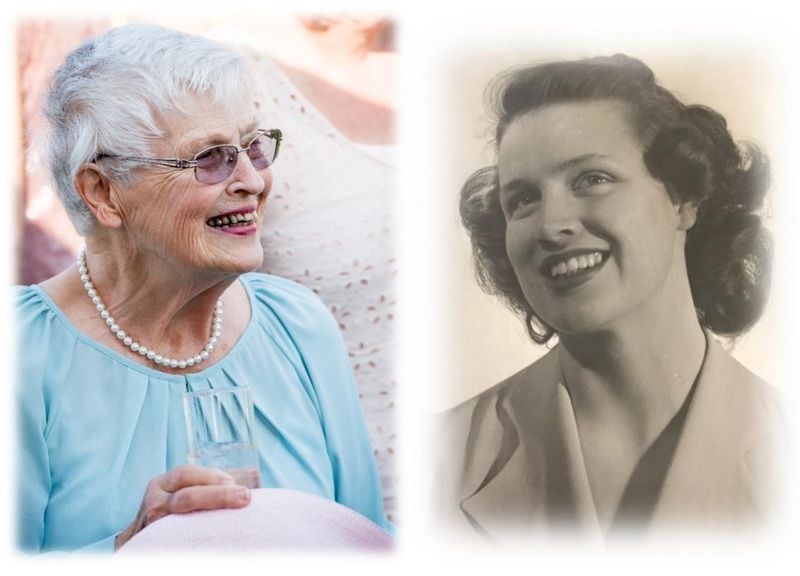 Carol May Sundberg, 91, homemaker and life-long resident of Seattle, Washington died May 17, 2018 at her home at Queen Anne Manor following a brief illness. The youngest of five children, Carol May Thompson was born June 6, 1926 to Carrie Cowgill and Alfred Lloyd Thompson. She grew up on Mercer Island and in the University District, where the family home became a boarding house run by her mother following the death of her father. At one point, her widowed mother’s finances were so stretched, she was sent, along with her brother, Everett, to live for a short time with her Aunt May in Wallace, Idaho. As a child growing up during the Great Depression, she developed a strong sense of self sufficiency, frugality, and moral strength. Her youthful passions were swimming in Lake Washington, singing, the Christian faith, and helping her mother with cooking and serving at the boarding home. She carried those passions into later life. She attended Roosevelt High School, graduating in 1944 and went on to attend Mills College for two years, developing her interests in drawing and art. While at Roosevelt, she met Carl Alfred Sundberg and carried on correspondence with him for two years while he served in the Army overseas during World War II. Her writing abilities allowed her to pen countless thoughtful letters to family and friends throughout her life. Following the war, she married Carl on August 17, 1946 and they settled in north Seattle where Carl built a home. Their first son, Christian was born in 1949. Between 1950-75, Carl’s painting and decorating business was focused on Alaska’s military bases, hospitals, and schools. In 1951, they packed up the family and travelled the Al-Can Highway to Anchorage, Alaska, where they resided until 1958. During this time, their second son Kimbal, and daughters, Alayne and Kari were born. The Alaska years were filled with many camping and fishing adventures, while meeting the challenges of raising four young children in a small, remote home far from her Seattle roots. After returning to the family home in north Seattle, their third daughter, Linnea was born in 1962. Along with raising five children, Carol did volunteer work for the Seattle Milk Fund and Mills College Alumnae Association, serving as regional governor. She regularly attended Lake City Presbyterian Church, where she sang in the choir and served as Elder and Deacon, and later University Presbyterian Church. In the 1960s, she was concerned about unfettered condominium development along Thornton Creek and became a citizen activist to raise the attention of the Seattle City Council to improved zoning enforcement and the city’s oversight of environmental impacts. As Carl was frequently called away to his painting business in Alaska, Carol provided the stability and guidance needed by her growing family. Family travel was often organized around successive VW microbus and truck-camper adventures to Spirit Lake, Olympic Peninsula, Hood Canal, Mt. Rainier, Oregon, and California. Carol prided herself on hosting large gatherings for family and friends, often involving elaborate cooking and preparations taking several days. She was an avid bridge player and organized clubs and dinners with friends. In later life, she enjoyed travelling the world with Carl; visiting Europe, New Zealand, Australia, SE Asia, China, Canada, Mexico, and Costa Rica. Carol is survived by five children including two sons; Chris (Suzy) of Issaquah and Kim (Debby) of Friday Harbor, and three daughters; Layne of Friday Harbor, Kari (Tim) of Salem, OR, and Linnea (Derek) of Springfield, OR. Carol is also survived by six grandchildren, four great­ grandchildren, and her brother, Jim. She was preceded in death by her beloved husband of 59-years, Carl along with siblings; Lucille, Maryanne, Margaret, and Everett. A Memorial Service followed by reception will be held July 2 from 1:00-4:00 pm at Seattle’s University Presbyterian Church, 4540 15th Ave NE. Donations in Carol’s name can be made to University Presbyterian Church and American Diabetes Association. I was just thinking of Carl today as my daughter posted pictures of a camping box that she had grown up with in our household. I used to think my Dad built it, but it was Carl who had built it. That, of course, brought the wonderful Sundberg family to mind and I thought I would see what I could learn from Carol. Carol was a dear woman. I loved her smile, warmth, humor, and baking. When I got married, I was given a few recipes from women of Lake City Presbyterian, and hers were amongst them. I knew any recipe from Carol would be a good one. I am sorry for your family's loss. I am grateful, however, that she was part of my childhood years. Blessings on each one of the Sundberg family.